The United Nations has released the logo for the 2012 International Year of Co-operatives. 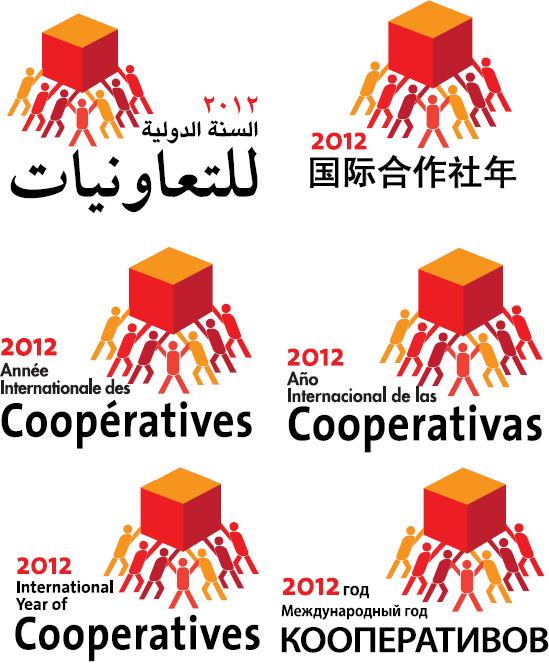 The logo of the International Year of Cooperatives 2012 evokes the definition of co-operative enterprises as autonomous associations of persons united voluntarily to meet their common economic, social and cultural needs and aspirations, through a jointly owned and democratically controlled enterprise. Based on the slogan of the year, ‘Cooperative enterprises build a better world’, the logo features seven persons working together to lift and support a cube. The cube represents the various projects goals and aspirations upon which cooperative enterprises are built, and the achievements that can be attained. The gender neutral figures represent the people factor central to the co-operative model, and there are seven of them, to represent the seven principles of the cooperative movement, i.e. voluntary and open membership, democratic member control, member economic participation, autonomy and independence, education, training, and information, cooperation among cooperatives, and concern for community. As illustrated by the logo, these seven principles work together to allow co-operative members to achieve the goals and desires that they would not have been able to attain through their individual efforts.